It has been an interesting week. Last week’s sermon about marriage equality went viral on social media, and as a result, I’ve spent a fair chunk of the week answering comments and questions online and responding to various forms of media. I even did an interview for SBS radio that went to air overdubbed in Mandarin Chinese so, when I listened to it, even I couldn’t understand what I was talking about! I know that many people who have spoken up on either side of this issue have been subjected to some pretty hostile and nasty responses, but fortunately, that hasn’t been my experience this week. The overwhelming majority of the reactions and comments have been positive and affirming, and those who have expressed their disagreement with what I said have mostly been quite civil and respectful about it. A few have called me a liar or a false prophet or even just a fool, but nothing nastier than that, and I’ve been called those things for decades without having yet found myself cut off from God and cast into the outer darkness. One of the more serious things that has been raised in various ways by a few of those who have taken exception to what I said is the question of authority. As one respondent put it, “I do not believe you have any authority to say these things, especially as a teacher of the Word.” The question of what authority I have to teach the things I teach is actually a perfectly fair question, and it deserves a serious answer. I too am allegedly overturning things which many religious people think I should not be overturning. Hence the question put to me: “By what authority are you doing these things, and who gave you this authority?” Now the fact that I am being challenged with the same question as Jesus doesn’t prove anything at all. It is entirely possible that Jesus has a good answer to that question and that I don’t. Although the problem that we have is that Jesus doesn’t actually answer the question. He asks his interrogators a question of his own, and when they opt not to answer, he follows suit and excuses himself from answering their question. Fortunately though, the question he asks of them, and the story he follows it up with give us some pretty good hints as to his answer. And since we are all called to model ourselves on Jesus – a theme that was more explicit in our reading from the letter to the Philippians (2:1-13) – that should also provide some direction for an answer about my authority to teach and preach as I do. Now apart from the reported fact that this question left them between a rock and a hard place because either answer snookered them, the question itself tells us quite a lot about Jesus’s approach to authority. The mainstream approach to authority among the religious people of Jesus’s day was that it was all about the biblical law. The scribes, the experts in biblical law, held considerable authority, and most of the other authority figures, especially the priests but also the kings, were seen as holding an authority that was legislated for in the biblical law. So when Jesus was asked about his authority, the expectation was that he should try to defend his authority on the basis of the biblical law, either by identifying himself as a biblically mandated authority figure, perhaps even the messiah, or by showing that everything that he did and taught was simply biblical. Frequently the criticism of the prophets by the religious mainstream was that they taught things that were contrary to biblical law, and that charge was frequently quite true. One of the things that Jesus often quoted from the prophets was the saying that God desires mercy, not sacrifice. There is absolutely no question at all that the biblical law said that God demands sacrifices, but the prophets said no, not sacrifice but mercy. And Jesus agreed. John the baptiser was regarded by the people as a prophet, so Jesus’s question about him was a question about whether they acknowledged that the prophets too carried the authority of God. And of course, Jesus’s own action of shutting down the temple system the previous day was a classic example of symbolic protest in the tradition of the prophets. If they acknowledged that John was a prophet from God, then they would have trouble denying the same about Jesus. So where does that leave us? 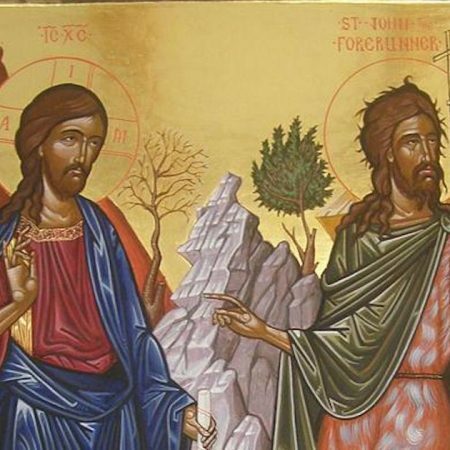 Clearly Jesus saw his authority as being the same as the authority of the prophets, but that is always a complicated and contentious form of authority. The biblical record shows that it is almost always only recognised with hindsight, after the death of the prophet. I guess Jesus knew what he had coming to him. Where does that leave us on the question of authority, and can I too answer my challengers with some sort of claim to prophetic authority? But how then are we to judge the truth of a prophet or a prophetic teaching? Jesus alludes to an answer here in our passage with his story about the two sons, but because he is not directly answering the question put to him, his answer is a bit veiled, so I want to interpret it by putting it alongside a more direct teaching he gives on the subject in his sermon on the mount (Matthew 7:15-23). This then is essentially the same thing that Jesus is saying in his parable of the two sons in tonight’s reading. One son says all the right things when his father asks something of him, but he doesn’t follow through on it. Bad fruit. The other son initially appears to be disobedient, but then has a change of heart and does what his father wants. Good fruit. The one who actually does the will of the father is not the one who can say the right things and sound like he respects the commandment, but the one who bears good fruit. My friends, I can’t stand here and claim that everything I teach is perfectly true and to be trusted. I do my best. I pray. I study the scriptures. I try to open myself to the breeze of God’s Spirit and allow it to carry me where it will. Sometimes I will get it wrong, and when you think I have got it wrong, I would encourage you to speak up and explain why. But ultimately, I would ask you to judge me, not by whether I just repeat the usual biblical lines as understood by the religious mainstream, but by the fruits of my teaching. If my teaching is contributing to this church community growing in its love for God and for others, and in its mercy and care for those who have been wounded and cast out by others, is that not good fruit? If my teaching is enabling people to discover the truth that they are deeply loved by God and to be set free to live out the culture of grace that is the kingdom of God, is that not good fruit? Ultimately, it is what I sometimes call the “Jesus sniff test”. Does it smell like Jesus? You can use the Bible to defend stoning sexual sinners to death, but it doesn’t pass the Jesus sniff test (John 8:1-11, only the last few words of which seem to be popular with my critics!). The teachings of Jesus and the Apostles, recorded in the Bible itself, teach us to read the Bible through the lens of the life, ministry and teaching of Jesus; to apply the Jesus sniff test. Does this teaching, or this way of expressing and applying a teaching seem to be consistent with the way that Jesus operated and expressed himself? Is it bearing the sorts of fruits that Jesus’s ministry produced, such as people who had previously been written off as god-forsaken sinners flocking to him and lapping up his gracious words and embracing the costly path of radical love, or is it, as some have alleged this week, producing an insipid bunch of lukewarm backsliders who don’t stand for anything and just pander to the values of the world around them? Look and see and judge for yourselves. My friends, if you need a church community that will always conform to the accepted evangelical orthodoxies, this is probably not the place for you. But, at the risk of sounding hopelessly self-righteous myself (guilty as charged! ), if you will judge our biblical interpretation and teaching and the quality of our shared life, prayer and ministry by its fruits, this just may be the place that your soul hungers for, and here at this table, you may find yourself embraced in the loving arms of Jesus and fed and nourished for life in all its fullness. Power and control can be exercised (sometimes severely) by governments, managers, teachers, parents and preachers (especially in earlier times when congregants could not read). It can be very authoritarian and prescriptive. Influence is the impact someone (or a group etc) can have on someone else (or a group) because they are frequently right, insightful, helpful, and otherwise consistently producing output deemed valuable. It can also be the confident quality of someone who knows a lot about something and who is respected by other people. 4. He is a follower of Jesus. But in addition to that he is given authority by the congregation (both physical and on-line) to lead, to teach, to encourage, to critically analyse and to challenge. We give him the authority (to influence) because we choose to listen, to respond, and to be continually empowered by an interpretation of the scriptures most relevant to the 21st century. We also have the power to withdraw that authority if we ever see that “the fruits of the spirit” are not being delivered! The reason the tax collectors and prostitutes will enter before the priests and elders is because they turned away from their life of sin and started living a life pleasing to God. Hi Cameron. Thanks for sharing your thoughts. I don’t think we are actually disagreeing on the exegesis of that verse. We are both agreed that Jesus is saying that people responded to the preaching of John and changed their lives and behaviour. We are perhaps disagreeing on what behaviours constitute sin and what behaviours are pleasing to God, but neither of our views on that would arise from our exegesis of this passage. We would both be bringing them to our reading of this passage. Blessings to you.